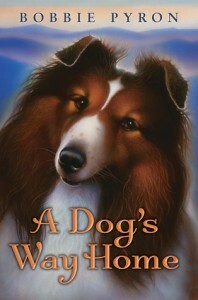 “A Dog’s Way Home” by Bobbie Pyron (Katherine Tegen 2010) alternates the stories of spunky 6th grader, Abby, and Shetland Sheepdog, Tam, an agility champion. Both the fact that this is a middle grade novel and by its name, you can be pretty much assured that things are going to turn out okay—that the lost Tam will find his way home. Otherwise I couldn’t bear to read it. Gone is the era of “Old Yeller” and Bambi’s mother being shot by a hunter. I appreciate the fact that nowadays we protect our young from…well…devastating outcomes. That said, plenty goes wrong for both girl and dog. In fact, I can barely believe that the dog, always in pursuit of food, could survive attacks from the claws of a raccoon, then a bear, the quills of a porcupine, not to mention his traveling hundreds of miles through snowy mountains, but he does. I’m passionately rooting for him, turning those 324 pages fast as I’m able. There’s plenty of sorrow—more than I anticipated—but it makes the story stronger. Throughout the day I read the book, one or both our dogs slept at my side. When the eagle swoops down on Tam, gouging him with her talons, to steal his rabbit dinner, my little hound twitched in her sleep. I might have been reading her the story. When the man hurls a bottle at Tam, my Lil groaned in her dream. Abby’s belief in her dog, her instinct that he’s coming home to her moves us almost as strongly as Tam’s adventure. Her family must move from the North Carolina hills to follow her struggling country-singing father when he gets a contract to record in Nashville. The final chapters alternate faster and faster, getting shorter and shorter—Abby, Tam, Abby, Tam, hurrying you along. You don’t care that it’s late at night and you should turn out the light. You read to the end and for days after you remember both Tam’s plight and Abby’s dedication to her dog. At the end I didn’t cry politely, but blubbered out of control. In gratitude and relief. Tam is never anthropomorphized, but remains a dog through and through. 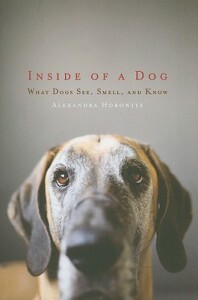 Having just read “Inside of a Dog: What Dogs See, Smell and Know” by Alexandra Horowitz (Scribner 2009), I’m privy to the latest, abundant research on dogs. Author, Pyron, clearly is, too. Patricia Hruby Powell (www.talesforallages.com) is a children’s book author, nationally touring speaker, dancer, storyteller, and librarian. I blubbered over all the animal books from my childhood, and it almost (but not quite) makes me want to be a kid again. I already commented on Facebook about having an amazing Sheltie named Tam. I got him when I was eleven years old. I loved your review! This book sounds as if it’s a Lassie-Come-Home tale for today’s kids (and adults like me). I have written a short story with a similar plot and structure. Guess I should have been more ambitious and quicker, but I can’t wait to read this one. Thanks for a great review. Thanks, Sheila. It blows my mind that you had a Sheltie named Tam. Who did your math assignments for you 😉 This books is clearly for you. Me, too. I’m reading dog books right now planning to write a dog book, based on the speculations I’ve been mustering about my rescued Tree Walker Hound, Lil. I was planning to call it Underdog Railroad. (The tradition is, you’re not supposed to voice your writing plans) but…not sure I’ll write it now. Because I loved Bobbie Pryon’s book so much. Hi all! Patricia, thanks so very much for reviewing my book! And Sheila, it blows my mind too that you also had a sheltie named Tam! The Tam in my book is named after Tam Lin, from the old Scottish fairy tale. Who (or what) was your sheltie named for? I hope that this message finds its way to the author of A DOG’S WAY HOME. I read and commented on Patricia’s review last fall but just read and loved the book recently. I decided to re-check the review and discovered Bobbie’s comment. My mother named my sheltie either for the Scottish poem by Robert Burns or for the little Scottish woolen hat called a tam o’shanter, but I always called my dog just plain Tam. He was an amazing little dog who excelled at learning just about anything I wanted him to do. He even could do simple math problems by barking the correct answer. Only he and I knew that I was giving him a tiny signal that told him to stop barking at the appropriate number. I now have three dogs, all mutts, whom I love dearly, but little Tam will always live in the home of my heart. Hi Sheila! Patricia made sure I saw your comment! Again, I LOVE the fact that you had a sheltie named Tam! I named “my” Tam (in the book) for the prince Tam Lin in an old Scottish fairy tale. Tam Lin was kidnapped by the Fairy Queen and taken to live underground. It’s through the love of the ever-faithful Janet that he finds his way home. It was one of my very favorite stories growing up. BTW, I do have a new-ish book out, THE DOGS OF WINTER. It cam out this past October. Very different than Tam’s story. This new book is based on a true story and is set in Russia in the mid 1990’s. Thanks again and hugs to your mutts!